With the release of not one but two LEGO-themed movies in theaters, plus the re-release of two sought-after LEGO sets, 2017 has yielded a cornucopia of excellent LEGO sets across many themes. Here at The Brothers Brick, we reviewed nearly 70 of the sets LEGO released in 2017, which is still just a fraction of all the new sets that LEGO produced this year. As you wrap up your holiday shopping (perhaps complemented by more than just LEGO sets), here are our favorite LEGO sets among those we reviewed here on TBB in 2017. The best and most detailed LEGO Y-wing released since 1999 depicts a Blue Squadron starfighter from the Battle of Scarif in Rogue One. 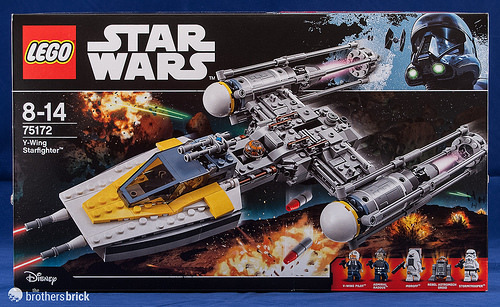 75172 Y-wing Starfighter includes 691 pieces with 5 minifigs for $59.99, which was already a fantastic price for a Star Wars set, but is currently reduced further at $47.99 from Amazon. We loved the combination of vintage and modern race cars in 75881 2016 Ford GT & 1966 Ford GT40, celebrating the victories of Ford cars in 1966 and 2016 at the 24 Hours of Le Mans race. 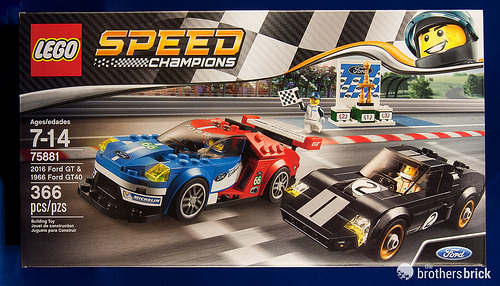 The set comes with 366 pieces to build two cars, and retails for $29.99 — if you can find it anywhere! The largest modular building set so far at 4,002 pieces arrived in January 2017 to commemorate the 10th anniversary of the first modular, 10182 Cafe Corner. True to the spirit of its forebears, 10255 Assembly Square set is highly detailed both outside and inside. Assembly Square retails for $279.99 — a steal for over four thousand pieces. 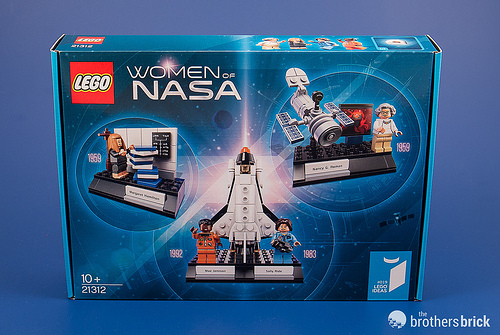 The most recent LEGO Ideas set honors four women who have been instrumental in moving human spaceflight and exploration forward. While some of us were certainly disappointed that the final set didn’t include a minifig of Katherine Johnson (featured in the movie Hidden Figures), that doesn’t dampen our enthusiasm for 21312 Women of NASA. The set includes three excellent mini-builds built from 231 parts and retails for $24.99. There have been rumors among LEGO fans — perhaps just wishful thinking — for years that LEGO might release a comprehensive rollercoaster system. Nobody expected that system to appear in a set supporting The LEGO Batman Movie. 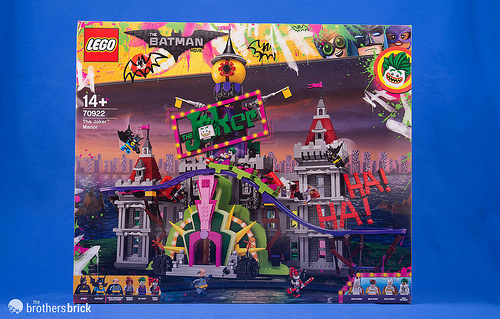 70922 Joker Manor is a complex, detailed build with an amazing array of colors. The rollercoaster itself rolls smoothly and we even proved that it’s possible to power the LEGO rollercoaster. At $269.99, the set includes 3,444 pieces and 10 minifigs. 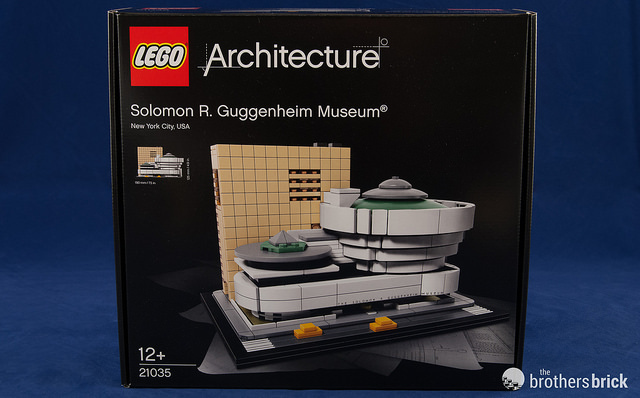 Most LEGO Ideas — including our other favorites in this list — are inspired by something else, whether that’s something from the real world like the Saturn V or the Women of NASA or something from the world of pop culture. 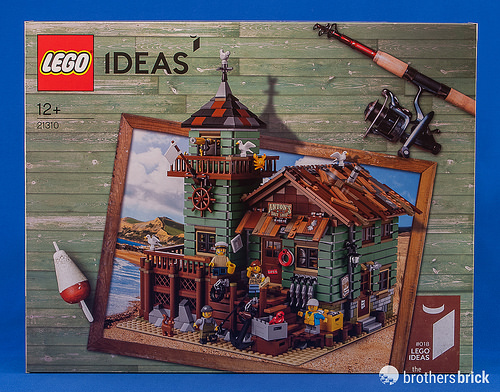 21310 The Old Fishing Store, on the other hand, is a truly original LEGO set inspired by nothing more than the fan designer’s own creativity and imagination. 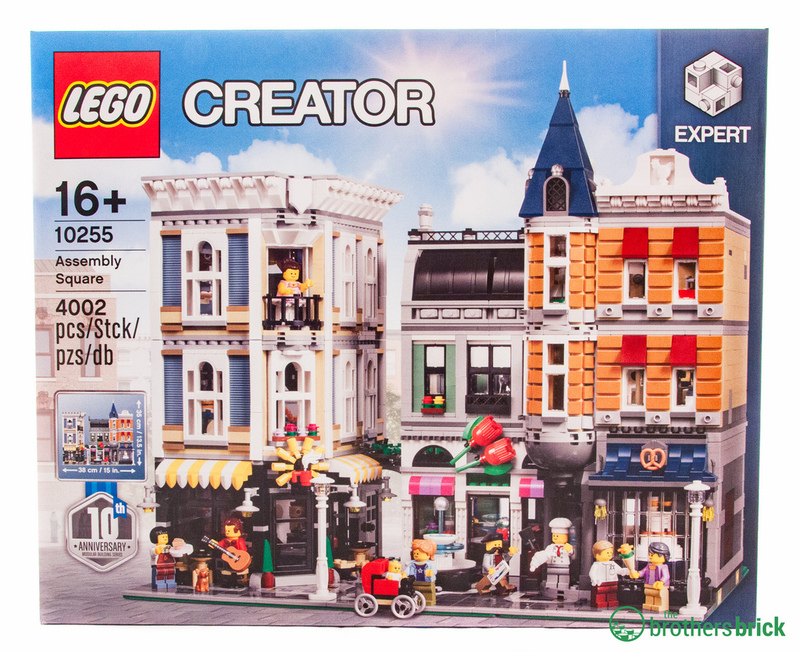 With detail rivaling modular buildings, the set includes 2,049 pieces and four minifigures for a retail price of $149.99. Yes, 75192 UCS Millennium Falcon may be a re-release, but the LEGO Star Wars design team put the extra 2,500 pieces to good use, adding several interior sections and a much higher degree of detail on the exterior. 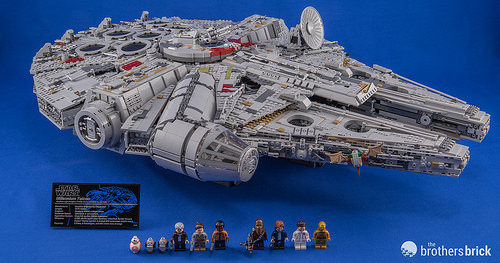 The largest LEGO set ever released at 7,541 pieces with 10 minifigs, the new UCS Falcon costs a monumental $799.99. But even if you can afford it, good luck buying it — there’s still a waiting list nearly three months after the set’s original release date. We had fairly low expectations about The LEGO Ninjago Movie itself (though we were pleasantly surprised), but we’ve been especially impressed with the LEGO sets inspired by the movie. 70620 Ninjago City blew us away with its cyber-punk aesthetic, intricate build, and sheer height — 4,867 pieces (and 19 minifigs) crammed onto a 32×32 footprint. At “only” $299.99, this is another steal for the sheer part count, but most importantly it’s truly fantastic set deserving our #2 spot for the year. 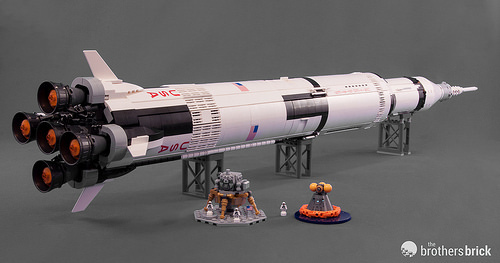 Rocketing to the top spot in our list of the best sets released in 2017, 21309 NASA Apollo Saturn V put us over the moon with its shockingly innovative building techniques that attached a curved outer skin to a square internal core, plus a totally unexpected level of functionality with its detaching stages and Lunar Lander. Like the #2 Ninjago City above, the Saturn V is a great value at only $119.99 for 1969 (yes, 1969) pieces. LEGO fans everywhere agreed that this was an amazing set, and it remains very hard to find nearly six months after its release. Interested that the stand on your Saturn V appears to be grey. Mine is blue. Unquestionably my favourite set ever. That’s an effect of Photoshop work on the background. The photos were taken against a blue sheet of nearly the same color as the stands, so their color got changed too when the background was made gray. ^ That’s correct — an accident of color correction we forgot to fix before linking back to that post from earlier this year.